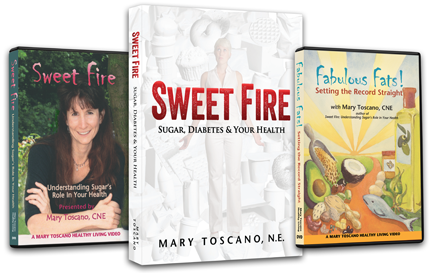 Many Thanks do not seem to express the sentiment I have for your DVD and your desire to share all that you have learned through the years of being a nutritionist. How many years have I heard DON'T EAT SUGAR!!!! I sort of knew why but I wasn't a chemistry major so I really didn't know why.. Your DVD told me WHY & HOW in the easiest laymen terms and in a way that I clearly could understand and see. Your liver, pancreas and kidney characters running around trying to make it all work really stuck with me. I never thought of my body working so hard all the time. It took time for me to also realize the tiredness, crabby depressed/high feeling was coming from overworking my system (all those "peanuts" falling on the ground) in a way that it could never catch up -- I was on a train heading straight to chronic illness. You also helped me sort out all the not so obvious food that contain sugar. Your clear, easy to understand demonstrations and diagrams gave me a map to knowing how to eat well all the time. I use to sip orange juice (healthy so I thought) all the time along with milk ... so many teaspoons of sugar from that simple act of trying to be healthy. White pasta was always my lunch. see if this is what you want. I can only say this is what I want ... I will not go back!!! Never! I will not be eating white bread, white flour, sugar. I have lost 2l lbs to date ... this was not my goal. no croutons and dressing ... but can bring my own with a piece of chicken from their menu and avoid sugar all together when I am in a hurry. I just feel soooo much better. I sleep better. My cravings for sugar has fallen off the chart I chose the fruit that will provide some sugar but the fiber, nutrients (you explained this extremely well too) too. I am going on but I have struggled with this my entire life and I finally understand this. I can't go back. I know too much now. I am thrilled you are also taking this to schools. My husband and I were healthy food eaters. We did not go to fast food restaurants, didn't eat any processed food, only fresh but we both had lots to learn. Many Thanks is not quite enough to say, You have helped me retain and regain my health. The greatest gift anyone can have and give. I hope your DVD is seen by many. Your work is important.